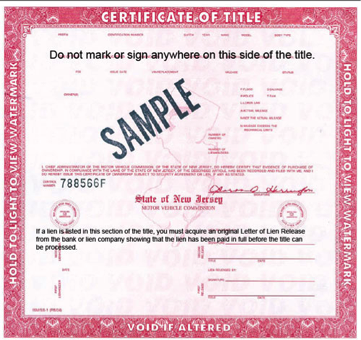 In New Jersey, whenever someone buys or sells a car, they must transfer the certificate of title to the new owner. The car title, sometimes known as “pink slip”, is issued by the Secretary of State from your local New Jersey Motor Vehicle Commission (MVC). It is a certificate that legally proves the ownership of a vehicle and can be transferred whether the vehicle is new, sold, gifted or inherited. The certificate of title is a record of the cars lifespan and ownership, including important identifying characteristics. Versions of vehicle titles can vary from state to state, but they all will contain vehicle specifics such as the VIN (vehicle identification number), make, and year of manufacture. It will document mechanical data such as the vehicle weight, motive power, and odometer. The license plate number, the owner’s name and address, purchase price, and details of any debts are also included. Remember to never keep your car title inside your vehicle, but stored somewhere safe. How Do I Apply for a Car Title? Car titles can be acquired by visiting the motor vehicle agency in person with the necessary documents. Based on if the title is for your new, used, or an out of state vehicle, knowing what you need to bring to the MVC is essential. When purchasing new vehicles from a dealership in NJ, they should perform the titling during the sales process. In the case that you did not receive a title upon purchase, you have 10 days to get it titled without facing a penalty fee. You will need to have the Manufacturer’s Certificate of Origin (MCO) with a stamp showing it is sales tax satisfied. Some vehicles are exempt from sales tax, but if it is owed you can pay it at the MVC. To apply for titling of financed vehicles, the address and Entity Identification Number (EIN- formerly Corpcode) of the lien holder is required and then the lien holder will be sent the original title. Newer vehicles may also need to meet emission and fuel standards that could be subject to surcharges. To apply for the title of a pre-owned vehicle you need to bring the previous title to the MVC. The assignment section on the back of the title must be filled out and signed by the former owner. Details include information such as sales price, odometer reading, and seller’s name and address. A car bought out of state by a NJ resident can be titled in NJ with a more detailed process. Be prepared to bring original documents showing evidence of ownership and follow instructions based on if your car is new or used. New cars will need the Manufacturer’s Certificate of Origin (MCO). Used car owners must have the VIN and former registration if no title exists. You will also need a mileage statement, NJ insurance card, and NJ driver’s license. Circumstances that require a replacement for a vehicle’s title are when it goes missing or has been damaged. In most cases, the MVC will issue a duplicate for lost or stolen titles after you submit a request for replacement in person or by mail. You will just need to have your current registration and proof of insurance. Next, fill out the “Application for Duplicate Certificate of Ownership” form and pay a $60 fee. If there is no proof of ownership available, you will need to fill out additional forms. When there is a lien on the vehicle, the duplicate title will be sent to the lien holder. A damaged vehicle title can also be replaced at the MVC or by mail. You will need to prepare a written statement describing how it was damaged, along with your name, address and vehicle description such as make, model, and VIN. Include the old title and a $60 replacement fee. Careful, fines can be issued to a person who knowingly has the original title and requests a duplicate. Be careful. If there’s an error on the title that’s your fault, the NJ MVC will charge you $60 to fix it. But if the NJ MVC makes a mistake on the title, corrections are free. Submit a request by mail or at the MVC agency to make corrections to your title. You will need to provide the original title along with proof of the error. How Do I Apply for a Car Title Transfer? Anytime a car is bought or sold, the title must be transferred to document the change of ownership. To transfer the certificate of title, a trip to the local Motor Vehicle Commission (MVC) is required. You can speed this process along by being prepared with the necessary documents and understanding the process of the buyer and seller’s responsibilities beforehand. Be sure to transfer the title within 10 days from the Date of Sale. Otherwise, you’ll end up paying a $25 penalty fee. If there's no lien (a type of property claim, explained in more detail below) on your car, you will apply for a NJ car title transfer in person at a MVC branch. You'll also complete a Sales Tax Stamp at the MVC office, and you are exempt from payment if you bought your car in another state (not NJ) and you were a resident of another state when you bought the car only. The seller needs to sign the reverse side of the title and the bill of sale needs to be filled out with the car buyer’s name and address, sale date, odometer reading, purchase price, and signature. Take the plates off the car you’re selling and turn them over to the MVC or transfer them to another car. You can transfer plates to another car, but not to another owner. Once the title transfer is completed, hand the certificate of title over to the buyer. The buyer of the car also has some responsibility. They are required to sign the back of the title, provide his/her driver license number (or EIN), and report to an MVC agency to register the car and pick up the plates. A part of becoming a New Jersey resident is transferring your car title within 60 days of moving. 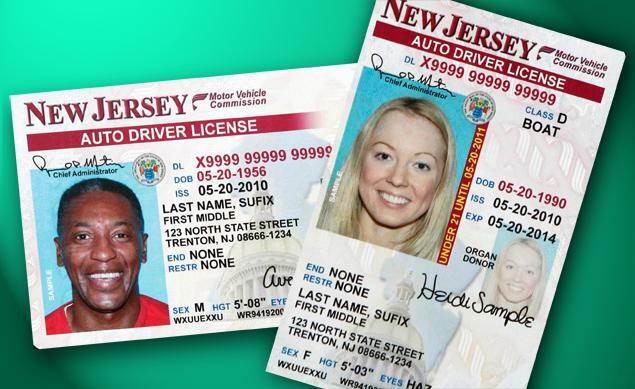 Bring your ID, original title and current insurance information to the local NJ MVC. If you are leasing or financing a vehicle, fill out the appropriate forms for the title to be released from the lien holder or leasing company to the MVC. When they receive the document you will need to go back to complete the “Application for Certificate of Ownership”, apply for registration, and pay the fees. Owners with no liens will be given their titles immediately. Vehicle owners with liens or leases will be given a receipt as the original title is mailed to the lien holders or leasing company. What Does “Gifting” a Car Mean? A car is exempt from sales tax if indicated that it’s a gift on the sales tax form. How Do I Claim an Inherited Car? In New Jersey, you can use the vehicle up to 30 days after the owner's death without applying for a vehicle title transfer. When you go to the MVC, they’ll require proof and an in-person visit to the agency (these requests are not processed by mail). Remember to bring ID, any/all supporting paperwork (i.e. relationship to the owner of the car, will or death certificate), and the completed and signed title. Once the transfer is authorized by the MVC, be sure to update your car insurance policy with your new vehicle information. The NJ MVC website has additional information regarding what happens when someone dies without a will in place. What Should I Know About Liens and Fees? A lien is a legal claim of ownership on a car that is contractually set against your personal property. It’s a collateral safeguard for the seller in case someone doesn’t make the required payments on the car. Once a car loan is paid off, you own the car outright and the lien is removed. Usually, the lienholder will take care of this for you. When the lien release is signed and mailed to you, make an appointment with your local NJ MVC office. Once you’re there, submit the lien release, a completed vehicle title transfer application, and pay the transfer fee. If you opt to mail the documents, keep in mind that there will be additional processing time. What Should I know About Sales Tax and Exemptions? Some cars are exempt from sales tax in the state of New Jersey based on how the vehicle was acquired, how it was used (i.e. commercial), if the car was a gift, etc. Please find the complete list of exempt vehicles on the New Jersey Motor Vehicle Commission website.